1964 Independence Ave. SW, Washington, D.C. The Martin Luther King Jr. Memorial is located in West Potomac Park in Washington, D.C., southwest of the National Mall. The national memorial is America's 395th unit in the National Park Service. The monumental memorial is located at the northwest corner of the Tidal Basin near the Franklin Delano Roosevelt Memorial, on a sightline linking the Lincoln Memorial to the northwest and the Jefferson Memorial to the southeast. The official address of the monument, 1964 Independence Avenue, S.W., commemorates the year the Civil Rights Act of 1964 became law. Covering four acres and including a granite statue of King by sculptor Lei Yixin, the memorial opened to the public on August 22, 2011, after more than two decades of planning, fund-raising and construction. A ceremony dedicating the Memorial was scheduled for Sunday, August 28, 2011, the 48th anniversary of the "I Have a Dream" speech that Martin Luther King Jr. delivered from the steps of the Lincoln Memorial in 1963 but was postponed until October 16 (the 16th anniversary of the 1995 Million Man March on the National Mall) due to Hurricane Irene. Martin Luther King Jr. (January 15, 1929 – April 4, 1968), an American clergyman, activist, and prominent leader in the African-American Civil Rights Movement, was an iconic figure in the advancement of civil rights in the United States and around the world, and advocated for using nonviolent resistance, inspired by Mahatma Gandhi. Although during his life he was monitored by the FBI for presumed communist sympathies, King is now presented as a heroic leader in the history of modern American liberalism. The centerpiece for the memorial is based on a line from King's "I Have A Dream" speech: "Out of a mountain of despair, a stone of hope." A 30 feet (9.1 m)-high relief of King named the Stone of Hope stands past two other pieces of granite that symbolize the "mountain of despair." Visitors figuratively "pass through" the Mountain of Despair on the way to the Stone of Hope, symbolically "moving through the struggle as Dr. King did during his life." Some of King's words reflected in these quotations are based on other sources, including the Bible, and in one case—"the arc of the moral universe" quote— paraphrases the words of Theodore Parker, an abolitionist and Unitarian minister, who died shortly before the beginning of the Civil War. In addition to the fourteen quotations on the Inscription Wall, each side of the Stone of Hope includes an additional statement attributed to King. The first, from the "I Have a Dream" speech, is "Out of the Mountain of Despair, a Stone of Hope"—the quotation that serves as the basis for the monument's design. The words on the other side of the stone used to read, "I Was a Drum Major for Justice, Peace, and Righteousness", which is a paraphrased version of a longer quote by King: "If you want to say that I was a drum major, say that I was a drum major for justice. Say that I was a drum major for peace. I was a drum major for righteousness. And all of the other shallow things will not matter." The memorial's use of the paraphrased version of the quote was criticized, and was removed in August 2013. The rescheduled dedication on October 16 was a smaller affair than the one that organizers had planned for August 28. 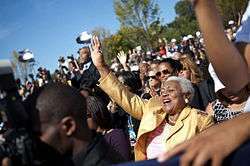 President Obama, First Lady Michelle Obama, Vice President Joe Biden, Congresswoman Nancy Pelosi, Congressman John Lewis, Congressman Elijah Cummings and former Congressman Walter E. Fauntroy were among the more than 10,000 people that attended the event, which occurred on a temperate day. Obama gave a keynote address that linked the civil rights movement to his own political struggles during the late-2000s recession. Jesse Jackson, Andrew Young, Al Sharpton and Martin Luther King III also spoke during the ceremony. 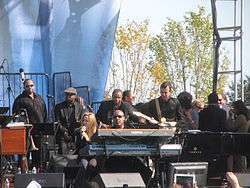 Aretha Franklin, Stevie Wonder, Sheryl Crow, James Taylor, Jennifer Holiday and Sweet Honey in the Rock performed. And so, as we think about all the work that we must do –- rebuilding an economy that can compete on a global stage, and fixing our schools so that every child -- not just some, but every child -- gets a world-class education, and making sure that our health care system is affordable and accessible to all, and that our economic system is one in which everybody gets a fair shake and everybody does their fair share, let us not be trapped by what is. We can’t be discouraged by what is. We’ve got to keep pushing for what ought to be, the America we ought to leave to our children, mindful that the hardships we face are nothing compared to those Dr. King and his fellow marchers faced 50 years ago, and that if we maintain our faith, in ourselves and in the possibilities of this nation, there is no challenge we cannot surmount. The NCPC disapproved the design and location of the proposed donor wall within the memorial's visitor center in September 2010. The inclusion of the donor wall violates the Commemorative Works Act (40 U.S.C. 8905) as amended, as well as the Commission's policies on donor recognition. The relevant section of the Commemorative Works Act states that "contributions to commemorative works shall not be acknowledged in any manner as part of the commemorative work or its site." It was announced in January 2007 that Lei Yixin, an artist from the People's Republic of China, would sculpt the centerpiece of the memorial, including the statue of King and the Stone of Hope. The commission was criticized by human rights activist Harry Wu on the grounds that Lei had sculpted Mao Zedong. It also stirred accusations that it was based on financial considerations, because the Chinese government would make a $25 million donation to help meet the projected shortfall in donations. The president of the memorial's foundation, Harry E. Johnson, who first met Lei in a sculpting workshop in Saint Paul, Minnesota, stated that the final selection was done by a mostly African American design team and was based solely on artistic ability. Gilbert Young, an artist known for a work of art entitled He Ain't Heavy, led a protest against the decision to hire Lei by launching the website King Is Ours, which demanded that an African American artist be used for the monument. Human-rights activist and arts advocate Ann Lau and American stone-carver Clint Button joined Young and national talk-show host Joe Madison in advancing the protest when the use of Chinese granite was discovered. Lau decried the human rights record of the Chinese government and asserted that the granite would be mined by workers forced to toil in unsafe and unfair conditions, unlike that used in the National World War II Memorial, for example. Button argued that the $10 million in federal money that has been authorized for the King project required it to be subject to an open bidding process. President Obama talks with President Dilma Rousseff of Brazil as they tour the Martin Luther King Memorial in Washington, D.C., June 29, 2015. On the other hand, King's son Martin Luther King III was quoted as being pleased with the sternness of the depiction, saying that "Well if my father was not confrontational, given what he was facing at the time, what else could he be?" ↑ "The National Mall". National Mall Plan (PDF). Foundation statement for the National Mall and Pennsylvania Avenue National Historic Park. National Park Service. pp. 6–10. Retrieved April 11, 2011. 1 2 Adam Fetcher; David Barna; Carol Johnson (August 29, 2011). "National Park Service Press Release: Martin Luther King Jr. Memorial Becomes 395th National Park". nps.gov. Retrieved September 1, 2011. 1 2 3 4 "Site Location - Build the Dream". Martin Luther King Jr. National Memorial Project Foundation, Inc. Archived from the original on September 19, 2011. Retrieved April 28, 2016. ↑ Tavernise, Sabrina (August 23, 2011). 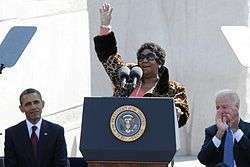 "A Dream Fulfilled, Martin Luther King Memorial Opens". The New York Times. 1 2 3 4 Cooper, Rachel. "Martin Luther King Jr. National Memorial in Washington, DC: Building a Memorial Honoring Martin Luther King Jr.". About.com (part of The New York Times Company). Retrieved August 24, 2011. 1 2 "Lincoln Memorial". We Shall Overcome: Historic Places of the Civil Rights Movement: A National Register of Historic Places Travel Itinerary. National Park Service. Retrieved September 14, 2011. ↑ "Dedication of MLK Memorial postponed by hurricane". USA Today. Associated Press. August 25, 2011. Retrieved August 25, 2011. 1 2 Weil, Martin (September 11, 2011). "MLK memorial dedication set for Oct. 16". The Washington Post. Post Local. Retrieved September 12, 2011. 1 2 "New date set for MLK memorial dedication". CBS News. Associated Press. September 14, 2011. Retrieved September 14, 2011. ↑ D'Souza, Placido P. (January 20, 2003). "Commemorating Martin Luther King Jr.: Gandhi's influence on King". San Francisco Chronicle. ↑ Avlon, John (January 16, 2012). "The MLK Whitewash". Daily Beast. Retrieved October 7, 2012. ↑ "March on Washington for Jobs and Freedom". King Encyclopedia. King Research and Education Institute. Retrieved October 7, 2012. ↑ Dlugan, Andrew (January 16, 2012). "'I Have a Dream' holds 5 lessons for speechwriters: Rev. King's stirring address resonates in oratorical circles as well as historical ones.". Ragan.com. Retrieved October 7, 2012. ↑ "Martin Luther King - Biography". Nobel Media AB. Retrieved September 10, 2011. ↑ Michael E. Eidenmuller. "Martin Luther King, Jr: A Time to Break Silence (Declaration Against the Vietnam War)". American Rhetoric. Retrieved September 10, 2011. ↑ Sullivan, Bartholomew. "Martin Luther King Jr. focused on ending poverty". The Commercial Appeal. Retrieved September 10, 2011. ↑ Honey, Michael K. Going Down Jericho Road: The Memphis strike, Martin Luther King's last campaign. New York: Norton, 2007. ISBN 9780393043396. ↑ "1968: Martin Luther King shot dead". On This Day. BBC. 2006. Retrieved August 27, 2008. ↑ "Mission & Vision - Build the Dream". Martin Luther King Jr. National Memorial Project Foundation, Inc. Archived from the original on September 16, 2011. Retrieved April 28, 2016. ↑ "The President's Letter - Build the Dream". Martin Luther King Jr. National Memorial Project Foundation, Inc. August 28, 2011. Archived from the original on September 19, 2011. Retrieved April 28, 2016. ↑ "Martin Luther King Jr.". Alpha Phi Alpha Fraternity, Eta Lambda chapter. Archived from the original on October 16, 2008. Retrieved October 20, 2011. ↑ "1950-59". Alpha Phi Alpha Fraternity, Inc., Sigma Chapter: 17th-House. 2009. Retrieved September 10, 2011. 1 2 Wesley, Charles H. (1981). The History of Alpha Phi Alpha, A Development in College Life (14th ed.). Chicago, Illinois: Foundation. pp. 381–386. ASIN: B000ESQ14W. ↑ Gray, Butler T. (2006). "National Mall Site Chosen for Memorial to Dr. Martin Luther King Jr.". black-collegian.com. Retrieved December 12, 2011. ↑ Wheeler, Linda (December 5, 2000). "'Sacred Ground' Dedicated to King; Plaque Placed at Site of Memorial for Civil Rights Leader". The Washington Post. Retrieved April 16, 2009. 1 2 "King Memorial Raises Goal by $20 million". Alpha Phi Alpha. Associated Press. August 13, 2008. Retrieved April 16, 2009. ↑ Malone, Julie (December 4, 2008). "Rights pioneers visit King site]". The Atlanta Journal-Constitution. ↑ "NAR Donates $1 million to the Martin Luther King Jr. Memorial". National Association of Realtors. Retrieved October 20, 2007. 1 2 3 Zongker, Brett (October 29, 2009). "Construction to begin on King memorial in DC". Associated Press. Archived from the original on November 5, 2009. Retrieved October 20, 2011. ↑ Ruane, Michael E. (February 11, 2011). "Massive King memorial nearly ready for trip to Mall for assembly". The Washington Post. Retrieved August 26, 2011. ↑ Quinn, Christopher (January 17, 2010). "King Memorial done by 2011, construction started". Atlanta Journal-Constitution. Retrieved October 20, 2011. ↑ Ruane, Michael (December 2, 2010). "Stone by Stone, 'Hope' rises". The Washington Post. p. B1. 1 2 3 4 5 "Design Elements - Build the Dream". Martin Luther King Jr. National Memorial Project Foundation, Inc. Retrieved September 10, 2011. ↑ "King's Memorial To Stand Among D.C.'s Honored". Around the Nation. NPR. January 15, 2011. Retrieved October 20, 2011. 1 2 3 "Martin Luther King Jr. National Memorial Review". Fodor's Travel Guides. Retrieved September 10, 2011. 1 2 Johnston, Lori (February 8, 2010). "Q: How is it that Martin Luther King Jr. gets a memorial on the mall in Washington, D.C.? I was under the impression that only presidents were entitled to have a memorial.". Atlanta Journal-Constitution. Retrieved September 10, 2011. ↑ "John Ericsson National Memorial (U.S. National Park Service)". National Park Service. February 14, 2011. Retrieved September 10, 2011. ↑ "JONES, John Paul: Memorial north of - across Independence Ave - near the Tidal Basin in Washington, D.C. by Charles Henry Niehaus located in James M. Goode's The Mall area". dcmemorials.com. Retrieved September 10, 2011. 1 2 Golub, Evan. "Quotations from Inscription Wall of Martin Luther King Jr. Memorial". Demotix. Retrieved September 10, 2011. ↑ "Martin Luther King Memorial Wall". About.com. Retrieved September 10, 2011. 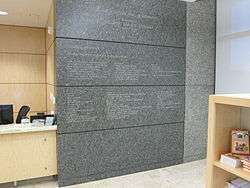 ↑ "Council of Historians SelectsMartin Luther King Jr. Quotations to Be Engraved Into Memorial - Build the Dream". Martin Luther King Jr. National Memorial Project Foundation, Inc. Retrieved September 10, 2011. 1 2 3 4 5 6 7 8 Weingarten, Gene; Ruane, Michael (August 31, 2011). "Maya Angelo Says King Memorial Inscription Makes Him Look Arrogant". The Washington Post. Retrieved February 26, 2014. ↑ "Martin Luther King Jr. Memorial, official brochure prepared by the National Mall and Memorial Parks, National Park Service, U.S. Department of the Interior, Washington, D.C.
↑ "Announcement of Quotations to Be Engraved on Martin Luther King Jr. National Memorial - 'Stone of Hope' Sculptor to Be Named - Build the Dream". Martin Luther King Jr. National Memorial Project Foundation, Inc. Archived from the original on March 6, 2012. Retrieved April 28, 2016. ↑ Henry J. Reske (August 26, 2011). "Obama, MLK Memorial Wrong on 'Arc' Quote". Newsmax. Retrieved September 10, 2011. ↑ Stiehm, Jamie (August 26, 2012). "At King ceremony, a chance to bend toward justice". The Washington Post. Retrieved May 11, 2012. ↑ Stiehm, Jamie (September 4, 2010). "Oval Office rug gets history wrong". The Washington Post. Retrieved May 11, 2012. 1 2 Wemple, Erik (August 29, 2011). "A monumental misquote on the Martin Luther King Jr. memorial". The Washington Post. Retrieved September 10, 2011. 1 2 "Controversial MLK Memorial inscription to be removed". CNN. December 12, 2012. Retrieved December 13, 2012. 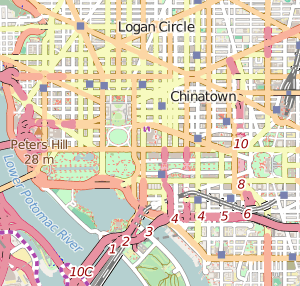 ↑ "National Mall Times", National Park Service, U.S. Department of the Interior, Vol. 4, Issue 8, August 2011, pages 5-6. ↑ "Week of Dedication". Martin Luther King Jr. National Memorial Project Foundation, Inc. Retrieved September 10, 2011. ↑ "MLK Jr. Memorial Dedication Postponed Indefinitely". NBC News. August 25, 2011. Retrieved August 26, 2011. ↑ "Dedication of King memorial postponed due to Irene". CNN. August 25, 2011. Retrieved August 26, 2011. ↑ Nuckols, Ben (August 25, 2011). "Dedication of MLK Memorial Postponed by Hurricane". ABC News. Retrieved August 26, 2011. 1 2 3 4 Ruane, Michael E. (August 4, 2011). "Obama to speak at King memorial dedication in D.C.". PostLocal. Retrieved October 20, 2011. ↑ Boorstein, Michelle (August 25, 2011). "Earthquake-damaged Washington National Cathedral needs to raise millions". The Washington Post. Post Local. Retrieved August 25, 2011. ↑ "MLK memorial taking shape on Washington's Tidal Basin". ABC Action News. January 17, 2011. Retrieved September 10, 2011. 1 2 Spivack, Miranda S. (October 16, 2011). "President Obama speaks at MLK Memorial dedication". National: Full Coverage: The Martin Luther King Jr. Memorial. Retrieved October 18, 2011. 1 2 McClain, Matt; Kahn, Nikki; Carioti, Ricky; Mara, Melina; Antonov (October 16, 2011). "The Martin Luther King Jr. Memorial dedication". PostLocal: Full Coverage: The Martin Luther King Jr. Memorial. Retrieved October 18, 2011. ↑ Ruane, Michael E. (October 15, 2011). 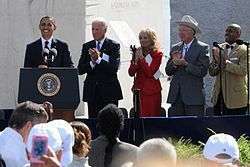 "MLK memorial dedication Sunday to feature Obama, stars and civil rights figures". PostLocal. Retrieved October 16, 2011. ↑ "MLK Memorial Dedication". C-SPAN. October 16, 2012. Retrieved March 16, 2013. ↑ President's dedication remarks, from Whitehouse.gov website. Retrieved October 22, 2011. ↑ Fears, Darryl (April 8, 2002). "Entrepreneurship of Profiteering? Critics Say King's Family Is Dishonoring His Legacy". jessejacksonjr.org. Archived from the original on September 28, 2007. Retrieved October 20, 2007. ↑ "King Family Takes Fees From Funds Raised for the MLK Memorial Project". Fox News Channel. Associated Press. April 17, 2009. Retrieved April 17, 2009. ↑ Shirek, John (April 22, 2009). "King Center: MLK's Children Not Making Money on Memorial]". WXIA-TV. Retrieved October 20, 2011. ↑ Jonathan Turley (April 22, 2009). "Cashing in on Martin Luther King Jr.". Los Angeles Times. Retrieved August 26, 2011. ↑ Haines (Associated Press) (August 23, 2011). "After long struggle, MLK has home on National Mall". Fox News Channel. Retrieved August 26, 2011. 1 2 Schwartzman, Paul (December 4, 2008). "King Memorial: Dispute Over Security Delays Construction". The Washington Post. Retrieved October 20, 2011. 1 2 Ruane, Michael E. (October 27, 2009). "Construction of MLK memorial on the Mall poised to begin". Metro. Retrieved October 20, 2011. ↑ "Martin Luther King Jr. National Memorial Bench Modifications" (PDF). National Capital Planning Commission. September 30, 2010. Retrieved January 16, 2012. ↑ "40 USC Chapter 89 - National Capital Memorials and Commemorative Works". United States House of Representatives. January 7, 2011. Retrieved January 19, 2012. ↑ "Chinese master sculptor to produce MLK memorial carving". CNN. February 15, 2007. Archived from the original on March 5, 2012. Retrieved April 28, 2016. ↑ Cha, Ariana Eunjung (August 14, 2007). "A King Statue 'Made in China'?". The Washington Post. Arts & Living. Retrieved October 20, 2011. ↑ Young, Gilbert; Lea Winfrey Young. "King is Ours". The He Ain't Heavy Foundation. Retrieved October 20, 2007. ↑ Lau, Ann (September 18, 2007). "Dissing MLK". National Review. Retrieved October 20, 2007. 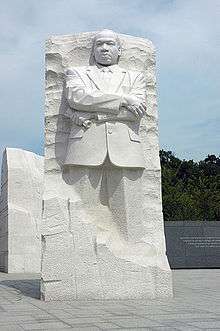 ↑ "Martin Luther King Jr. monument planners criticized for selecting Chinese sculptor for job". International Herald Tribune. August 24, 2007. ↑ Vondrasek, Sandy (November 15, 2007). "Button: Event Raised Profile of MLK Protest". The Herald of Randolph. Randolph, Vermont: OurHerald, Inc. Retrieved October 20, 2011. ↑ Shin, Annys (November 23, 2010). "As Chinese workers build the Martin Luther King memorial, a union investigates". Metro. Retrieved October 20, 2011. ↑ "History of the Memorial". Washington, D.C. Martin Luther King Jr. National Memorial Project Foundation, Inc. Archived from the original on October 10, 2007. Retrieved April 28, 2016. 1 2 Shaila Dewan (May 18, 2008). "Larger Than Life, More to Fight Over". The New York Times. Retrieved May 18, 2008. ↑ Page, Clarence (August 28, 2011). "Give King memorial a chance". Chicago Tribune. News Columns. Retrieved October 20, 2011. ↑ Delcore, David (November 8, 2007). "Press conference on Martin Luther King Jr. memorial draws enthusiastic crowd". Barre Montpelier Times Argus. Retrieved February 26, 2014. ↑ McLean, Dan (November 9, 2007). "Granite workers: 'King is ours'". The Burlington Free Press. p. A.1. Retrieved October 20, 2011. ↑ Fulbright, Leslie (November 28, 2007). "State NAACP joins protest of Chinese artist chosen for MLK monument". San Francisco Chronicle. Retrieved October 20, 2010. ↑ JohnBeckWLD (January 21, 2008). "Resolved: CA NAACP Should Rescind the First Half of Resolution 11 This MLK Holiday". The Straight Dope. Jelsoft Enterprises Ltd. Retrieved October 20, 2011. Originally Posted by California NAACP: Therefore be it resolved, the California State Conference of the NAACP demands that the decision to use Lei Yixin, from the People's Republic of China, an artist renowned for glorifying Mao Zedong be overturned; and denounces the decision to use granite quarried using slave labor, and demands that stone for the monument to Dr. King be quarried and carved in America; Be it further resolved, NAACP California State Conference calls upon Congress to conduct a formal investigation into the dismissal of sculptor Ed Dwight, who was originally contracted to serve as consultant and Artist-of-Record for the King memorial, and into the replacement of the African American firm Devroaux & Purness Architects; Be it finally resolved, that the California State Conference of the NAACP demands that the King Memorial Project Foundation name an African American artistic team as Artists-of-Record for the monument to Dr. Martin Luther King Jr. and that an oversight committee be created to enforce these resolutions. ↑ Rothstein, Edward, "A Mirror of Greatness, Blurred", New York Times, August 25, 2011, retrieved September 2, 2012. 1 2 Eversley, Melanie, "MLK Memorial confronts controversy", USA Today, July 5, 2011. Retrieved September 2, 2012. ↑ Wemple, Erik (August 25, 2011). "Martin Luther King a drum major? If you say so". The Washington Post. Retrieved October 19, 2011. ↑ Board&, Editorial (December 31, 2011). "Why hasn't the government done the right thing with the MLK memorial?". The Washington Post. Retrieved December 31, 2011. 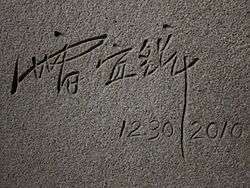 ↑ "Controversial King memorial inscription set to be erased, not replaced". The Washington Post. December 12, 2012. Retrieved December 13, 2012. ↑ "DISPUTED INSCRIPTION REMOVED FROM MLK MEMORIAL". Associated Press. Retrieved August 2, 2013. ↑ Heitmann, Danny (August 27, 2013). "Martin Luther King Jr. Memorial and the danger of the misquote". The Christian Science Monitor. Retrieved August 30, 2013. ↑ Chin, Curits S (August 24, 2013). "From Martin Luther King through Lei Yixin, a message for Asia". The Nation. Retrieved February 26, 2014. 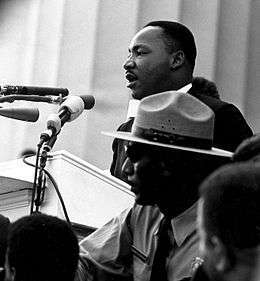 Wikimedia Commons has media related to Martin Luther King, Jr. National Memorial.